Winner of the first Violet Star Art Contest is “T. Rex” Davidson! The theme for this contest was “Battle”. T. Rex drew and inked a comic strip depicting Karma battling against a tough and brute thug in the underbellies of Blyton City. I have to say, I’m a fan of the dynamic poses and color palate. Congratulations T. Rex! You make the Ninja Clan very proud. Your Amazon gift card and signed copy of Violet Star should already be in the mail and reaching you soon. Keep posted for future challenges and contests, Ninjas! The Very First Violet Star Contest! With Prizes!! Hey Ninjas! It’s time for the very first Karma Chronicles Contest! Actually, the first TWO Contests! There’s two different challenges I conjured up. The first challenge will be to cosplay as one of the following five characters in Violet Star. For those that don’t know what cosplay is, it means to dress up and take on the persona of a character. Gotta have her signature violet bang! Free range with Han, but it’s practically an automatic win if you somehow get his flaming katana in the pic! Rock her black hair and red highlights. And know that you’re better than other ninjas. Show me your best shark mutation and get a craving for human flesh. Armor up and make everyone hate you. Bonus points go to any groups dressed as multiple characters. Oh, and poses count! If you decide to go for a group shot, costumes have to be spot on. If someone can pull off the “Three Musketeers” of the story, then boom! You’ll be in like Flynn! The other event is a character drawing contest. Let’s see your best art skills! The theme for this contest is called “Battle”. Show me at least two Violet Star characters going at it in an epic showdown in any art style for a chance to win! So, what are the prizes, you ask? First place for the Cosplay Challenge receives a $50 gift card to Amazon and a signed copy of Violet Star. In the event that a group wins, each member will be awarded a $50 gift card for Amazon. I’ll arrange something for any runner-ups and honorable mentions too! First place for the Battling Character Art Contest is a $25 Amazon gift card and a bookmark. You can submit your pictures and digital files in the Form Submission, or email them as an attachment to jolivermadison(at)gmail.com. Also, feel free to email me with any questions. 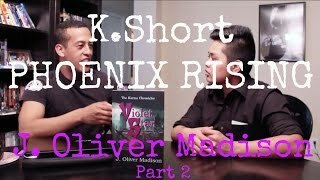 I’m glad I had a chance to meet interviewer and YouTube personality, K.Short, for her segment Phoenix Rising. She’s kind, full of positive energy, and has a way of making her interviewees comfortable! She can ask a single question and get an individual to tell their life story in a way they thought they never would. Thanks K.Short! You’re awesome and I’m happy to have had the opportunity of meeting you! The link to the video containing some of my deeper thoughts, inspiration for writing Violet Star, and overall mentality is in the link below! I do it for one reason. And that’s to receive the title. The status of an author is all I wish to claim. This chapter of my life is enlightening, but frightening all the same. Art canvases leave me drawing a blank, and following sports has never been my goal. My niche is plotting out my stories, trying never to leave a hole. Guess who just got an Instagram acount? I now have Instagram! Check out the link above to follow my shenanigans! Preview for an upcoming interview with YouTuber K.Short. She features local artists in AZ with segment her Phoenix Rising. I’ll post it once it’s up! Meanwhile, check out her channel here!